Rubb supplied defence organisation QinetiQ with a moveable environmental building for testing and evaluating MoD asset shelter provision. QinetiQ is a British defence technology company based in Farnborough, Hampshire, UK. 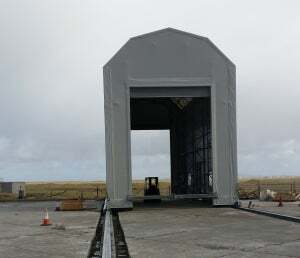 QinetiQ Estates needed a mobile 8m span x 18m long fabric building to cover the Terrier Orion Launcher at the MoD Hebrides Range at Rangehead, Benbecula. The Range is used for many tasks, including the release of short, medium and long-range munitions. Over recent years the Range has evolved to support the testing and evaluation of modern weapon systems for the MoD. The Rubb Launch Equipment Building (LEB) features a clear height to apex of 10m and is secured to ground level rails measuring 48m long. It covers and protects the Terrier Orion from the environment when loaded onto the launcher. The storage building can then be moved along the rails to reveal the launcher for testing procedures. Rubb structural engineer Dale Robinson explained: "The building incorporates a specifically designed roller system that allows the smooth transportation of the building to and from its permanent location. The rollers attach to the underside of the building footplates and the top of the foundation rail. "The rollers are designed to prevent the building from lifting off the track or sliding transversely. The movement of the building is carried out manually using a four-wheel machine, which attaches to the building gable end. "There is a simple locking device using pins to secure the building longitudinally when it isn’t in transportation. The building has a strict transportation routine to ensure the safest possible operation." Each gable incorporates a 5m wide x 7.5m high roller shutter door with two pedestrian access doors in each sidewall. Both sidewalls features clear PVC panels to allow monitoring and to assist in the transportation of the building. QinetiQ Hebrides Hard Services project manager Roddy Steele said: "Rubb Buildings were identified as a suitable supplier for our environmental shelter as Rubb have previously supplied buildings across many of our sites. "At the time of the initial correspondence there was no certainty that the trial was to proceed, but this did not deter Rubb who visited the site at their own risk to firm up on our requirement. "From these discussions a detailed design and quotation for the works was submitted for our review and subsequent approval. "Communication with the team initially with Grant and Andrew was good and this followed on to the design team with Dale. The works were delivered on time and on budget." Rubb technical sales engineer Grant Davidson said: "This was a very interesting project from start to finish. Liaising with the client and understanding the sensitive operations the building would be supporting was a critical factor in the design process. "I believe we provided a bespoke moveable building that will successfully perform in line with onsite operations in a remote location that is subject to severe weather conditions. It was a pleasure working with the QinetiQ team and we hope this project acts as a catalyst for any future requirements."